Snoring is the sound that is produced by obstructed respiration during sleeping. When air from the mouth or nose flows to the lungs, it can vibrate the tissues in the throat. This vibration can cause a detectable sound, referred to as snoring. Anyone at any age is capable of snoring but you may not be aware that you snore. Since snoring occurs during sleep, most people do not know they snore unless they have a bed partner who hears their snoring. Snoring can be symptomatic of a variety of health issues, including Sleep Breathing Disorders (SBDs) like Sleep Apnea. If you snore excessively or experience daytime sleepiness as a result of your own snoring or the snoring of your bed partner, Sleep Rehab can help. It's a common sleep breathing disorder in which you have one or more pauses in breathing or shallow breaths while you sleep. People with untreated sleep apnea stop breathing repeatedly during their sleep, sometimes hundreds of times. This means the brain and the rest of the body may not get enough oxygen. 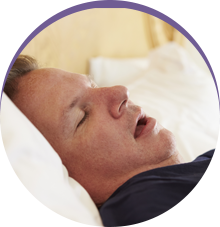 Thankfully, there are treatments available that will eliminate or reduce the effects of sleep apnea at Sleep Rehab. The only way to tell the difference between snoring and sleep apnea is with a sleep test. 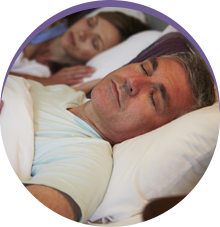 Even if your snoring is not caused by a serious SBD, Sleep Rehab can still help you reduce or eliminate the negative effects you or your bed partner experience from snoring. Snoring can affect the amount of sleep you get every night, your restfulness during the day and can be a nuisance for your bed partner. Here’s how to stop snoring! First, we will perform a sleep test to determine if your snoring is connected to a more serious SBD. After assessing the results of your sleep test, we will determine the best approach to help with your condition. If you snore, we will likely fit you for a customized oral appliance. This appliance will help open up your airways, lessening the vibrations in your throat. Less vibration means less snoring. 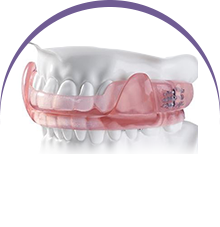 Worn regularly, this oral appliance will significantly reduce or even eliminate snoring so you can get the sleep you need.